You can make a delicious Chicago deep dish pizza in your own kitchen if you have a deep dish pan and a few hours to prepare. Create a tasty pizza with this recipe. To create a Chicago's famous pizza, you'll need a well-oiled deep dish pan. A Chicago crust usually has a buttery, flaky taste. I used Butter-flavored Pam to oil my pan. This recipe doesn't have to sit overnight, but you'll need to let it rise for about 1 to 1-1/2 hours. This recipe is adapted from an Emeril Lagasse recipe. I listed what he uses and then what I did (Emeril is probably a better cook than me, but my Chicago deep dish pizza turned out pretty darn good. Of course, I didn't stray too far from his recipe). This Chicago deep dish pizza recipe makes two deep dish pies. Combine the yeast, water and sugar in a large bowl and stir. Let the mixture sit for about 3-5 minutes or until it gets bubbly and foamy. Add 2 cups of flour (or 1-1/2 of all-purpose and 1/2 of the semolina if you are using it), 1/2 cup of oil and salt. Emeril says to mix by hand, but I used my Kitchen Aid mixer with the dough hook to mix it up. Mix until it's smooth. Continue to add the flour; 1/4 cup at a time, mixing the dough after each flour addition, until all the flour is in and the dough is still slightly sticky. 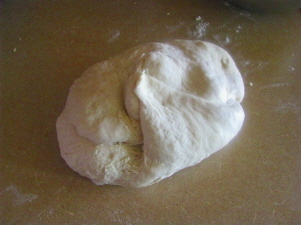 Put the dough on a lightly floured surface and knead it with the palm of your hand for about 3-5 minutes. The dough should be smooth but still slightly tacky. 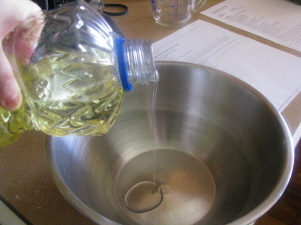 Oil a large mixing bowl with vegetable oil (I'm sure olive oil would work too). Rub the olive all over the sides of bowl to coat it. 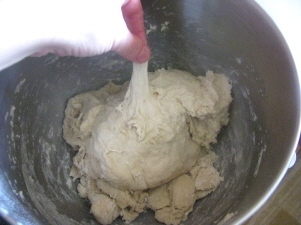 Place dough in the oiled bowl, flipping it once to coat all sides. 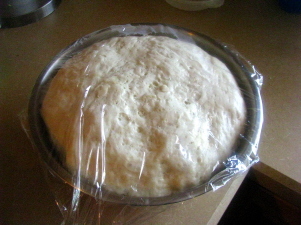 Cover with plastic wrap and place in a warm place for about 1 hour - or until the dough has doubled in size. 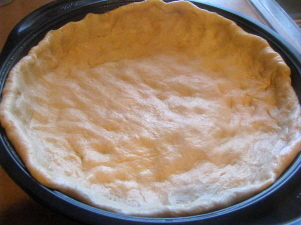 *While the dough is rising make your Chicago style pizza recipe sauce. You want to start your sauce pretty early in the process because it will need time to cool before pouring into the dough. Also, preheat the oven 475 degrees. Divide dough into two equal portions. You can make two Chicago deep dish pizzas or place 1/2 of the dough in an oiled Ziploc bag and put in the fridge or freezer for another day. Spray a deep dish pan with Butter-flavored Pam cooking spray (you can use oil, but I wanted to have a buttery flavored crust and the Pam worked great). Take 1/2 the dough mixture and press into a deep dish pizza pan. Press or stretch the sides up about 1/2 - 2 inches. Let the dough rest for about 5 minutes after you pressed it into the pan. 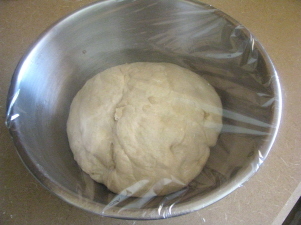 Next, fill your dough with the toppings and Chicago deep dish sauce and bake for 15-25 minutes. Enjoy your Chicago deep dish pizza!